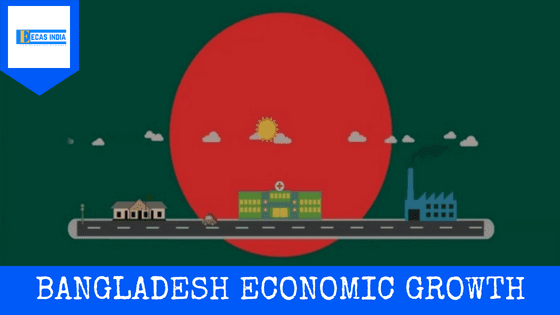 DHAKA, BANGLADESH: According to the IMF projections of GDP of Bangladesh and Pakistan, Bangladesh was supposed to cross the GDP of Pakistan in the year 2021. However, the situation has changed dramatically due to the unprecedented depreciation of PKR in the year 2018. According to Pakistan Bureau of Statistics as of June 2018, the GDP of Pakistan is 343,96 Billion PKR. With the current exchange rate of Rupee, which is 1 USD = 121.65 PKR, the GDP of Pakistan is 282.75 Billion USD. This is lower than the GDP of Bangladesh in June 2018 i.e. 286 Billion USD. This means that as per Pakistan Bureau of Statistics data, GDP of Bangladesh has already crossed Pakistan, promoting it to the second largest economy in South Asia. The per capita incomes of Pakistan and Bangladesh are USD 1,640 and USD 1,754 respectively. According to the Asian Development Bank, the GDP growth in the 2017 for Bangladesh and Pakistan were 7.3% and 5.3% respectively. However, the gap between per capita income between Bangladesh and Pakistan is growing. This is because of the higher GDP growth rate and lower population growth rate of Bangladesh in comparison to those of Pakistan. The population growth rate in Pakistan is 2.2%, whereas it is only 1.1% in Bangladesh. The gap in GDP per capita will continue to grow rapidly in foreseeable future. Bangladesh has also surpassed Pakistan in annual budget allocation. The annual budget allocations for Bangladesh and Pakistan in 2018-19 fiscal year are USD 56.18 billion and USD 48.76 billion respectively. This means that in absolute term annual budget allocation is about 13% higher than that of Pakistan. However, in real terms, the difference in annual budget allocation is much higher. Being a debt-ridden country, Pakistan will have to spend 2.22 trillion PKR, i.e. USD 18.25 billion for debt serving, which is about 37.4% of the annual budget. Again, Pakistan allocated PKR 925 billion, i.e. USD 7.60 billion for defense, which is 15.6% of the total annual budget. This means that in total 53% of the budget for the fiscal year 2018–19 of Pakistan will go either for debt serving or defense, leaving very little money for social and economic development. Therefore, in terms of real economic power, Bangladesh has already crossed Pakistan in all counts. It might be appropriate to look into the economic development of South Asia in terms of the Multi-dimensional Poverty Index (MPI). The MPI brings together the ten indicators, equal weighting for the education, health and living standards. Therefore, Bangladesh has lower multi-dimensional poverty compared with that of both Pakistan and India.